Earlier this month, your Sanara had the pleasure of hosting the fresh photography talents of Oscar Luna. Originally from Guadalajara, and now a Tulum expat. It is with his keen eye for detail and dedication to his subjects that he is able to capture the true beauty of every moment. Calling attention to the allure that is Sanara Tulum, Oscar has brilliantly photographed the hotel’s most recent happenings. From the highly celebrated Sound Healing Yoga class with Alessandra Montana, to the every-day surroundings and occurrences of the hotel. It is with the utmost gratitude we recognize Oscar for his talent and art. His attention to natural light and color is undeniably captivating take a peek at the life-giving photos below. For the undisciplined, Yoga can be quite intimidating. The elegant and precise movements achieved by a trained practitioner can both inspire and crush ones efforts all in single pose. A common challenge confronted by many, our Rudy Gonzales tapped the skilled trainings of Alessandra Montana, Sanara Tulum’s Yoga Studio Manager to delve into the different types of yoga and more importantly choosing the best style suited for you. Originated by a yogi named Sri Tirulma Kirshnamachayra, Vinyasa (vin-YA-sa) Yoga is a practice dedicated to movement carefully synchronized with breathing. Yoga is comprised of a series of asanas (poses & postures) that will advance a trainee through multiple forms of inhaling and exhaling. Each class is designed to coincide with the skill level performed by its attendees. Led by Sanara’s Alessandra Montana, and the always beautiful Luna Limon & Richelle Morgan, Vinyasa yoga is a perfect introduction for a beginner or a trained student in transition. Presented in a unique series of poses, Ashtanga Yoga instills a moral and ethical approach to postures, breath work, and most importantly meditation. A workout designed to ultimately produce a purifying sweat that detoxifies the muscles and organs. Available in beginner, intermediate, and advanced levels, Ashtanga is a style of yoga best suited for those with a little more experience. A more vigorous and fitness-based approach to Ashtanga and Vinyasa yoga styles, Power Yoga does not align with the typical set of poses. With its emphasis on strength and flexibility, Power yoga is considered by many to be the “gym yoga”. Both Ashtanga & Power Yoga classes are taught by Adriana Mangino, all levels are welcome to these power focused exercises. Celebrated as the ‘mother of all yoga’ styles, Hatha Yoga by it’s Sanskrit definition means willful or forceful. A representation of the masculine Ha is of the sun, and Tha represents the moon and femininity within all of us. The ultimate formulated yoga focuses on asanas (postures), dhauti or shodana (cleansing technique), pranayama (breathing exercise), bandha (locks) and mudra (hand gestures). 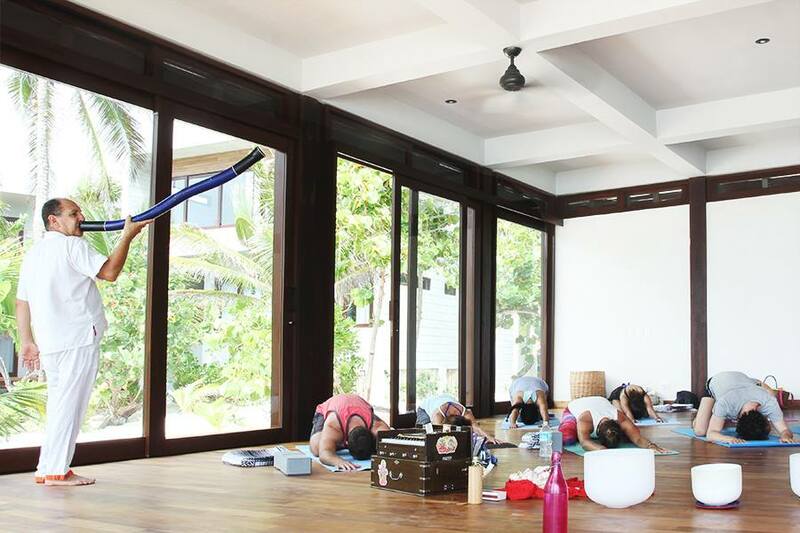 Taught by the handsomely talented Flavio Lopez, Hatha Yoga is ideal for the intrepid yoga going enthusiast. Another form of Hatha Yoga, Iyengar Yoga puts the emphasis on detail, precision and alignment within the performance of asanas (postures) and pranayama (breath control). Commonly performed with the use of various accessories such as; belts, blocks, and blankets to aid in the ultimate pose execution. Be sure to pick up your selected items before class starts. Instructed by Eugenia Russian, all levels are welcome. Last but not least, Pilates the highly coveted physical fitness program improves flexibility, strength, and is a key skill to refining muscle control and endurance. Taught by the highly trained Beatriz Aleman, and once again all levels are welcome. On a more personal note… If you’re anything like me you determinedly skimmed the page and felt completely lost. The biggest challenge is waking up early enough, and getting yourself there. Here are a few additional insider tips. 1. A male who practices yoga is called a Yogi, and a female practitioner, Yogini. 2. You’re not the only one confused, so don’t be afraid of making mistakes. 3. The word Yoga, from the Sanskrit word yuj means to yoke or bind and is often interpreted as ‘union’ or a method of discipline. 4. Hydrate yourself beforehand, think ‘road trip hydrate’ just enough to get to the end without all the pit stops. 5. Remember yoga poses are designed to re-direct the mind to a calmer place, meditation is the highest form of yoga, and breathing is the most important. It was a night of celebration, as Sanara Tulum held it’s seasonal Full Moon Yoga & Mayan Ritual program. Located inside the hotel’s sky lit studio, the event took place February 3rd, 2015 on top of the white coveted beaches of the Rivera Maya. Curated by renowned instructors Alessandra Montana & Luna Limon, the intimate study delves into yoga, meditation, and traditional Mayan practice. In paying homage to the ancestral ritual, guests are presented with a lovely alter comprised of various seeds and floral offerings for the full moon. Summoning what the Mayan’s refer to as the ‘Vision of The Universe’, the class begins with a light meditation. The rooms energy is carefully cleansed with an incense copal cup, while the drumming of the Temazcal drum pulsates throughout the background. Calling upon the five elements of earth, air, fire, water, and ether in an effort to manifest the moons energy, the Yoga practice begins. Light stretching and breathing exercises are skillfully guided by both Alessandra and Luna. The group is then coupled off, instructed to practice together, ultimately unveiling a palpable energy amongst one another. Finally, the group is formed into a circle with the pressing of hands, and the divinity of energy is conceived. Overlooking the Caribbean sea, the full moon rises. Alessandra lightly touches upon crystal singing bowls ending the course in a final traditional Mayan chant, accepting the new moon into our hearts, mind, and spirit. The next Sanara Full Moon Yoga & Mayan Course is scheduled to commence March, 5th 2015. Shh! It’s a secret… guest are allowed to bring personal items onto the alter in order to ultimately capture the moons sacred energy for themselves. Don’t forget to bring yours, I recommend ( a ring, bracelet, or a journal page).